Most of you probably already suspected this after knowing a friend or family member who can eat the same thing as you but it seems to affect them differently. Well there’s many reasons for this– the amount and type of exercise they do, their food environment, overall diet, and also their genes! So how important are your genes in determining your overall health? Well we know there are certain genetic relationships to various disease outcomes, but with new research, we now also can tell if your genes can impact how you absorb certain nutrients or foods which can impact overall wellness over time. Although this link between food and health is well known and documented, now that we have tools and data to interpret our genetic differences, it gives us a new dimension at looking at that link- one on a truly personalized nutritional level. This is exactly what nutrigenomics aims to study. This just means that based on our different genetic make-up, food affects each of us differently and the degree to which diet influences the balance between healthy and disease states depends partially on an individual’s genetic makeup. Nutritionists have recognized for years that individuals differ in their response to nutrient intakes. However, because we were not able to easily identify these differences for every individual before, the RDAs (recommended daily allowances) of common nutrients and other dietary intake advice were all based on population data that incorporates a certain margin of error to account for those variations in individuals genes. However, today with advances in science and the sequencing of the human genome, we now have the ability to do better– to make dietary recommendations and plans based on your OWN genes. Order a genetic test that uses saliva samples from a reputable lab. Most labs work directly with licensed professionals so you’ll usually order the tests through a licensed professional. The lab tests your saliva for at least 45 genetic markers currently known to affect aspects of your health including weight management and body composition, nutrient metabolism, eating habits, cardiometabolic health, food intolerances, and physical activity. This information is powerful because it can help you make more accurate dietary choices for your own optimal health. Let me give you an example of what I mean. So let’s say you have a certain genetic mutation in the FUT2 gene. This means you may not absorb vitamin B12 as efficiently as those without that mutation. Since vitamin B12 is essential for many processes such as normal brain function and reproductive health, knowing you have this mutation in the FUT2 gene would mean you need to consume vitamin B12 in a different format that your body can more efficiently absorb. Making this small change through food or specific dietary supplements could in turn help reduce your risk for certain disease states related to deficient or inadequate vitamin B12 intake. Research has shown that lower vitamin B12 levels is linked to increased risk of chronic conditions such as CVD and poor fertility. This is just one example of how knowing what your genes are and making small changes to your diet can impact your long term health and wellness. Today we can test for over 45 different gene mutations that may impact the way you absorb or don’t absorb certain nutrients needed for various functions in our body. The breakthroughs in this field are pretty exciting and is already helping people work towards their wellness goals in a more precise fashion than ever before. As the science and our data related to nutrient/gene interactions increases, the results that nutrigenomics can provide will become even more powerful and I’m super excited to see this. As the genetic testing companies continue to grow as a business, I highly recommend ordering tests through licensed professionals who can help to properly interpret and create a plan of action related to your nutritional needs based on your results. Doing the test through licensed professionals will also ensure you get your test done at a lab who is a leader in the field of nutrigenomics research. Currently, my practice, Crave Health, is partnering with the biotech company Nutrigenomix for our tests but we are always on the look out for other partners who can provide accurate and affordable pricing on this new emerging science. If you’re interested in learning how to eat according to your genes, please get in touch with me or another licensed professional! Nutrition Fact: 1 out of every 3 Children in the U.S. are Overweight or Obese. Announcing Smash Your Food™ ..now in the Apple App Store! It’s so sad to think that today in the U.S., more than one third of all children and adolescents are overweight or obese. Not only is childhood obesity linked to obesity as an adult, it also is linked to lower school performance during childhood. I know it’s easy to think that obesity is a problem caused by one’s inability to control their eating; but particularly when it comes to kids, it’s hard to blame this problem on children alone. Instead, multiple causes including the unhealthy food environment we live in today, growing portion sizes, and the lack of nutrition education of parents and kids when it comes to knowing what is in our food are to blame. 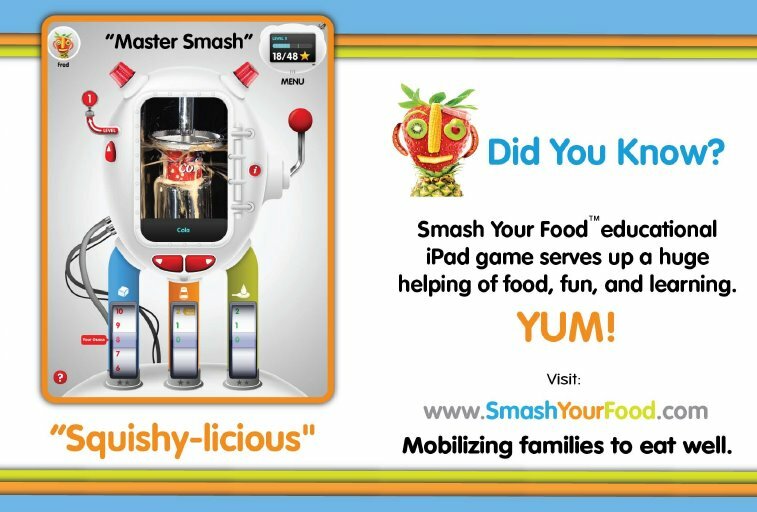 This is why I am so excited to announce the launch of Smash Your Food, an award-winning, educational game for the ipad that teaches kids to learn about the nutritional aspects of foods that contribute to excessive calories consumption and educates kids on how to make better food choices at home and on-the-go. I met the founders of Food’N’Me who came up with the idea of Smash Your Foods late last year and loved the concept and wanted to help out. So , for the last few months, I’ve had the privilege to have been working on this project on the weekends to help the nutrition team with nutrition analysis and research prior to the game’s launch. We’re also working on complementary e-books that will be released soon. While the ipad game is catered for kids, it is also eye opening for adults. For example, did you know that a fast food milkshake has three times as much sugar as a can of soda? The game works by first calculating your max amount of salt, sugar, and oil per meal based on your gender, age, and level of physical activity and then compares your levels with what is in commonly eaten junk foods many Americans eat. Before you SMASH the foods, you have to guess how much sugar, salt, and oil will come out of it. The closer you get to the actual amounts, the more stars you get and the more foods you unlock! Today, there are two versions of the game, a free version that let’s you test out the game by smashing five foods. Then, the paid version which is just $2.99 and includes additional levels with about 40 foods all together. This game will help teach you and your kids about what is actually in some of the most common unhealthy foods we eat. It’s super fun AND informative! Check it out for yourself at www.smashyourfood.com and feel free to leave any comments and feedback for us! Also, like us on Facebook and help us spread the word so that we can help teach kids how to make better choices about what they eat today and in the future! Earlier this week, the LA Times published an article called “All Red meat is risky” based on a new study released by the Harvard School of Public Health that found increased risk of premature death with increased red meat consumption. Some notable conclusions included that one 3 oz. serving of red meat per day was associated with 13% increased chance of premature death and change that to processed meat it jumps up to 20% increased chance of premature death. The article had stated that eating any kind of red meat in any amount was bad for you. Now before you go and give up red meat completely, I wanted to share a few key points/thoughts I had after reading the published study. I hope they help put things into perspective and help you make more realistic decisions. Dietary intake over the 20 years of the study was assessed using a Food Frequency Questionnaire (FFQ). While FFQ’s are the best dietary assessment tool we have aside from controlled feeding studies, they still are inherently flawed. They ask participants to retroactively remember what they eat, make estimates and guesses, and in many cases over simplify ones diet so it’s important to keep this in mind when making drastic changes and conclusions based on studies using FFQs. 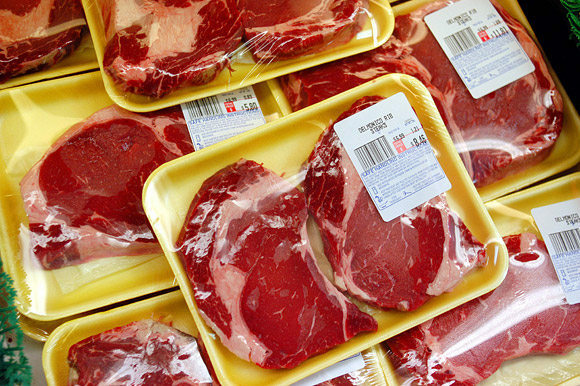 While the study did separate out unprocessed red meat from processed red meat, it does not separate out organic from non-organic or grass-fed red meat, and also the various types of leaner cuts of red meat from fattier forms. The study also found that replacing 1 serving of total red meat with 1 serving of fish, poultry, nuts, legumes, low-fat dairy products, or whole grains daily was associated with a lower risk of total mortality: 7% for fish, 14% for poultry, 19% for nuts, 10% for legumes, 10% for low-fat dairy products, and 14% for whole grains. This shows that by including other things in your diet and substituting some of your servings of red meat for healthier alternatives can help reduce the risk associated with red meat consumption. In addition, about a month ago, a study from Japan with more than 51,000 men and women over 16 years found no connection between moderate meat consumption up to 3 ounces a day and premature death and another study from the Havard School of Public Health on red meat also found no connection between red meat consumption and heart disease and diabetes, though it did find an association with processed red meat consumption and heart disease and diabetes. The bottom line is that if you do eat red meat, processed red meat should be avoided or greatly limited in our diet (things like hot dogs, bacon, fast food hamburgers, pepperoni, etc.) and that unprocessed red meat should be eaten in moderation (1-3 times a week). In addition, I find it interesting that the study in Japan found no connection between red meat consumption and premature death. From my experience visiting Japan, I think there are three reasons that may be the case. 1. Japanese don’t eat very much red meat in general and have a diet high in fish compared to Americans. 2. Their red meat is much more likely to be organic and grass-fed than most meat Americans eat. 3. When they do eat red meat, the serving is generally less than 3 ounces and is prepared as thin slices either boiled or lightly seared. I think more research is needed to make firm conclusions about whether or not grass-fed red meat is in fact much healthier and what amounts and cooking methods minimize risk, but based off ecological studies and comparisons, it may be true that what we feed our cows in America has an effect on how red meat affects our health, in addition to how much processed meats Americans tend to eat. So when you do eat red meat, try to choose more unprocessed red meats and try to consume leaner cuts. Below is a few of the extra lean cuts for you to choose from. It seems like Vitamin D has been the “fashionable” vitamin over the past few years mainly because there has been a trend in research suggesting vitamin D deficiency/insufficiency may play a role in various diseases other than just bone health. Additionally, while the the Institute of Medicine (IOM) increased their recommendations and upper limits for vitamin D for optimum bone health in 2010, other experts don’t agree with those recommendations and more and more research is showing increased intake may protect against several chronic diseases. So, with all the controversy and inconclusive evidence out there how do you tease out what you really need to know about Vitamin D? Let’s start by understanding what vitamin D is and where you get it from. Aside from these known functions Vitamin D plays, new research suggests that vitamin D status may also be linked to chronic diseases including cardiovascular disease, certain cancers, cognitive decline, depression, diabetes, pregnancy complications, and some autoimmune diseases. Although the link between Vitamin D and these chronic diseases is still inconclusive, it’s not surprising that there has been a dramatic increase in sales in Vitamin D supplements and manufactures of the vitamin dues to evidence of protection against certain chronic diseases. Where do I get Vitamin D from? Vitamin D is mostly obtained through skin exposure to UV B light where it is converted to the active form for Vitamin D (D3) in our skin. 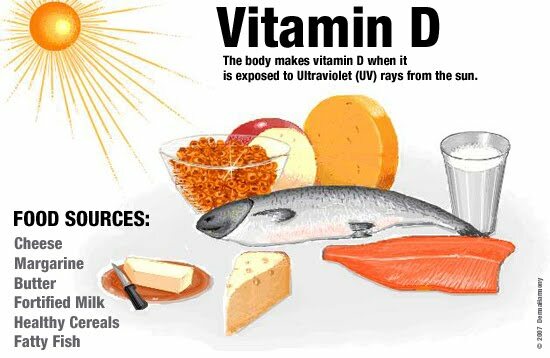 Some Vitamin D is also obtained from the diet in fortified foods such as milk, cereals, and juices as well as some natural foods such as some fish (i.e. salmon and sardines) and liver. But more recently many have been receiving vitamin D from supplements which either come in the form of D2 or D3. Those with darker skin tones. The increased melanin reduces conversion of sunlight to Vitamin D.
Those that don’t expose skin in the sunlight or wear high levels of sunblock all the time. Clothing and sunblock inhibit the conversion of Vitamin D from sunlight. Those that live in geographies that have less sun exposure. What are the recommendations for Vitamin D intake? The IOM also set the tolerable Upper Limits for Children 9 years and older at 4,000 IU/ day to prevent any toxicity from over consumption of Vitamin D. It’s important to keep in mind that these are conservative recommendations based only on the IOM’s review of the research related to optimum bone health. Many other experts are now recommending increased intake of vitamin D in light of new research linking increased Vitamin D status to lower risk of certain chronic diseases and based on data from a NHANES study showing that about 30% of Americans are Vitamin D deficient or at risk of being deficient according to IOM serum Vitamin D levels for optimum bone health. I personally was tested two years ago and was severely deficient as well. In order also project against some chronic diseases, some experts such as the Vitamin D Council are now recommending as much as 5,000 IU/day for adults. Get tested. Testing your Vitamin D level is a simple blood test and especially if your insurance covers it, I would recommend it. That will give you a basis on how much Vitamin D supplements, if any you really need. There are also tests you can do at home with a simple blood pinch that are fairly inexpensive with decent accuracy to give you some idea of your Vitamin D levels. Try consuming more Vitamin D rich foods from your diet. Natural is ALWAYS better so make sure you’re including enough milk, salmon, and other fortified foods in your diet to help increase your Vitamin D intake. Try to expose enough skin (arms and/or legs) to at least 5-15 minutes of sunlight twice a day. That amount of time without sunblock should provide you with more than enough Vitamin D while still minimizing risk to harmful side effects of sun exposure. Additional plus is that you can’t get Vitamin D toxicity from Vitamin D synthesized from sunlight, only from too much supplement or intake from the diet. If you do wish to take supplements, or if your doctor recommends it, make sure you take Vitamin D3 over D2 which research indicates may be up to three times more potent. After I finished my prescription dose of Vitamin D to get me back to a healthy blood level, my doctor recommends to get between 1,000- 2,000 IU/ day so I eat fortified foods and take a 1,000 IU supplement daily. That recommendation is based on the fact that I don’t get much sun exposure living in Seattle, have darker skin, and that my levels were low. So before you start popping 1,000 IU or 2,000 IU Vitamin D supplements per day, I would recommend you get your levels tested and try moderate sun exposure and diet before you choose supplements. That will prevent any potential toxicity from too much Vitamin D intake and will save you money…and who doesn’t need to save money right?